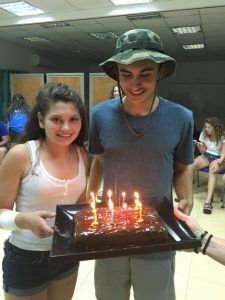 Micah in Israel: Time for Army Day! We are out of the desert and off to Army day! It has been an exciting week filled with fun and challenging times for the group. The Negev Adventure began with a sunset hike to our campsite. After settling in we enjoyed dinner and sat around the fire playing games and singing songs. The next day we rose early and began hiking. The hike was tough for some, and showed how incredibly supportive our Micah campers are to each other. It was an amazing sight to see. After swimming in a serene desert spring, we spent some much needed time inside (and got there by Safari truck!) As the kids have said “The Negev wasn’t bad, it was just complicated!” The group was definitely happy to be back living the hotel life in Kibbutz Ketura. We got to learn about the history of the Kibbutz movement, celebrate shabbat with the members, and even have an evening pool party! We spent a day in Eilat, where it reached an incredible 111 degrees! In one of the best days yet, we went snorkeling in the Red Sea, spent time at a rock climbing gym/ adventure park, and went to a shopping mall with an ice skating rink! We departed Ketura and headed north to another Kibbutz, Maayan Harod. We spent the morning at the ancient port city of Caesarea learning about archaeology and the diverse history of the region. The group then started to prepare for the much anticipated army day! 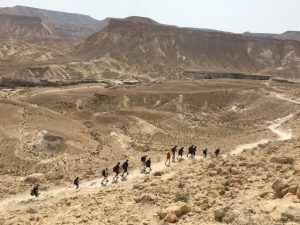 As we write to you they are being led by commanders on a challenging, exciting journey designed to put them in the shoes of an IDF soldier. We miss them already and can’t wait to hear about it!